How do you eat fondue properly? Where did fondue originate? Knowing the whimsical traditions and fascinating origins is half the fun, so let’s get started. I am sure you are eager to begin dipping into that gooey cheesey goodness, so here are a few tips for first time fonduists or even more experienced fonduists who just want to refresh their memories, to help you navigate the dos and don’ts of fonduing so as not to commit those dreaded “Fondue Faux Pas“. Traditionally you should always start your meal with dipping the bread. It really does make sense as it creates a great base for your tummy, especially if you are drinking alcohol. Scooping out the cheese from the pot is a no-no as it will make a huge mess on the table, one less thing to worry about when you are cleaning up. Dipping your food with your hands is another no-no, nothing could ruin your date night more than being rushed to hospital with third degree burns to your fingertips, ouch! Double dipping, what more can I say other than “don’t even think about it”! If you lose the food off your fondue fork in the pot remember to always retrieve it. 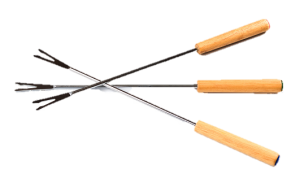 Fondue fork battles may sound like fun (en garde) but it is taboo to knock other forks out of the way. Always remember which fondue fork is yours, sharing is caring but not in this case. Eating from the fondue fork is considered bad manners and also dangerous as the forks get extremely hot and are very sharp. Always use your dinner fork to slide the food off the fondue fork on to your plate. When you dip a food into the fondue pot, always rotate the fork over the pot to stop the cheese dripping and to allow the food to cool a little before eating, another sure way to eliminate a mess and to keep the excess cheese in the pot, no wastage here. 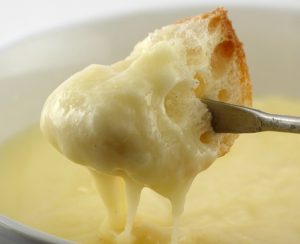 Swirling your fork around in a figure eight motion will help to keep the fondue fresh and velvety in texture. You are probably now thinking, wow, so many rules, but don’t let this dissuade you from hosting or attending a fondue get-together, they are there to make sure you have a delightful fondue experience. Have you had a funny Fondue Faux Pas? Would love to hear from you! Fondue originated in the high alps of Switzerland in the 18th Century. A traditional fondue pot is called a “caquelon“. Fondue comes from the French verb “fondre“, meaning “to melt“. The crispy cheese left at the bottom of the fondue pot is called “la religieuse” (“the nun“, in French). If a man drops a cube of his bread off his fork, he then has to buy a round of drinks for the table, but if a woman was to do so, she has to kiss her table neighbor. 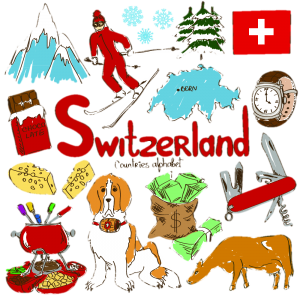 According to Swiss Lore there are only 3 drinks you should have with fondue, white wine, kirsch or a herbal tea, anything else they say can cause the melted cheese to coagulate creating major indigestion. 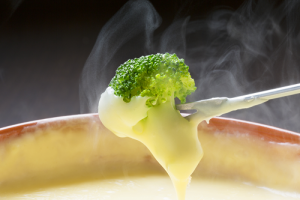 April 11 is National Cheese Fondue Day, a day to celebrate the delicious mixture of cheeses and wine which harmonizes with the bread, fruit and vegetables. The fondue certainly has interesting origins and traditions which has undoubtedly forged the way for us to create and enjoy with our family and friends such amazing dishes today. Thanks so much for the information you have provided on your website. Being new to fondue cuisine I have found it very helpful, especially on fondue etiquette as I am looking at hosting a dinner in the near future. This was a good read and really informative. There’s a fondue restaurant near me, but I’ve never really thought about etiquette. I will definitely be taking this advice next time I go. I am so pleased you enjoyed my article on Fondue Etiquette. There are a few dos and don’ts but they really make the whole fondue experience awesome. Happy fonduing! Thank you so much for taking the time to read my post. Fonduing is truly awesome and if you are new to it, knowing the etiquette will certainly make your fondue experiences a blast. All the best in your fondue journey! Enjoyed the article. . . brought back memories of my older brother’s Birthday dinner. We went to a Fondue restaurant in Ocean City, Maryland for his 29th. He and my other brother (27 at the time) got carded. The waiter looked at me and did not ask for my ID. We all got wine and my mother laughed, I was 16. To the waiter’s defense, I was as big as my brothers and the drinking age was 18 back then. Thanks for sharing your fondue story Ken, sounds like you had a wonderful night back then for your brother’s birthday. Fun memories like that are priceless and make life meaningful, you can look back and have a good laugh. Next Post: Dinner Party Themes – Spice It Up!